fun with mason jars, part 1 of ? the jello was an idea i saw on pinterest. it’s incredibly easy and doesn’t take much time at all. i used homemade whipped cream for mine. 1/2 pint of whipping cream in the mixer, and when it started to thicken, i added 1/8c white sugar and beat it until it was very stiff. when it was ready, i put it in the fridge while i prepped the jello. 1 c boiling water over 1 box of blue jello. mix til dissolved. add 1c (ish) icecubes and stir stir stir. after about 5 minutes, it will start to thicken. i didn’t think it was quite thick enough at that point, so i put the bowl in the fridge for about 20 minutes. when it is firm enough to still be a little liquidy but tight enough to hold a little shape, it’s ready. pour a layer of jello in bottom of glass jar. add a blop of whipped cream and push it against the glass. if it doesn’t go where you want, just wipe it off the glass and try some more. blop, blop, blop, then add more jello. then more clouds. really, it’s almost TOO easy. 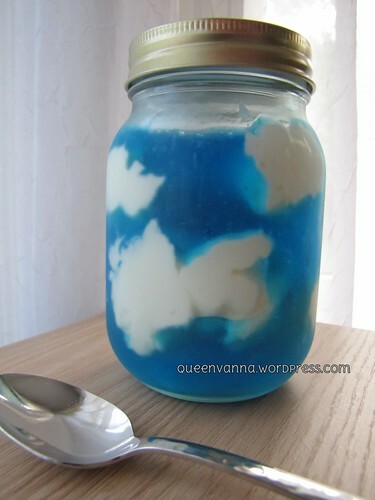 it’s really neat to see the depth of the cream in the jello, like puffy clouds! each jar might be a little bit too much for one serving, they might be cute in even smaller jars, but there’s plenty to share! 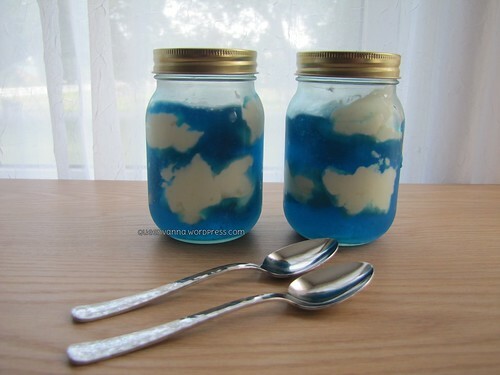 This entry was posted in foooooood, she's so crafty and tagged blue, clouds, cream, dessert, diy, gelatin, homemade, jello, recipe, saw it on pinterest, sky, summer, whip, whipped, white. Bookmark the permalink. Only you would be so clever!!! Love it and now tell us, now does the sky taste? This is too cute for words! Such a whimsical fun dessert! I pinned it and can’t wait to make it this summer! Thanks for the fun share! 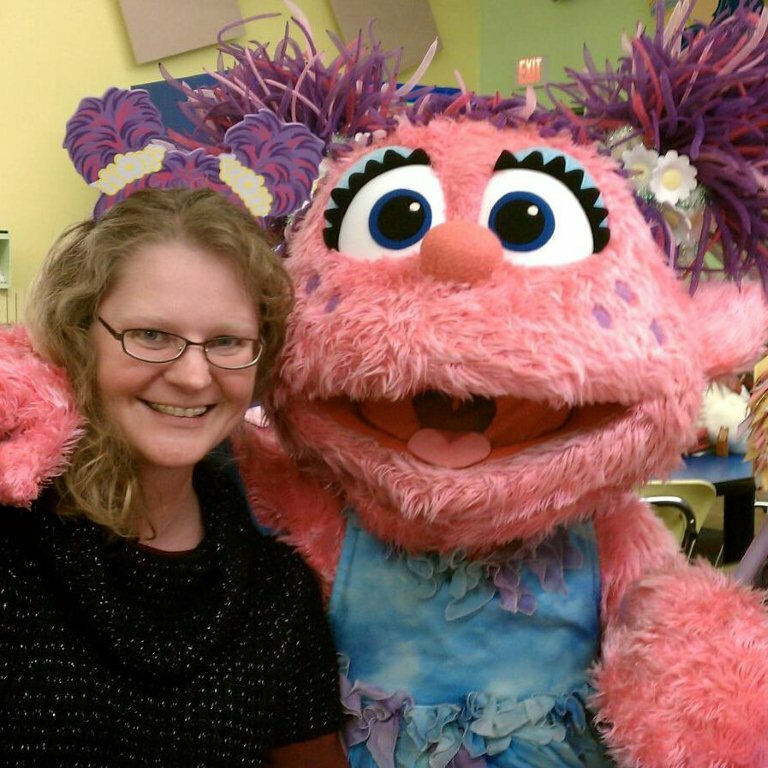 I am a preschool teacher and my class loved doing this as an activity.